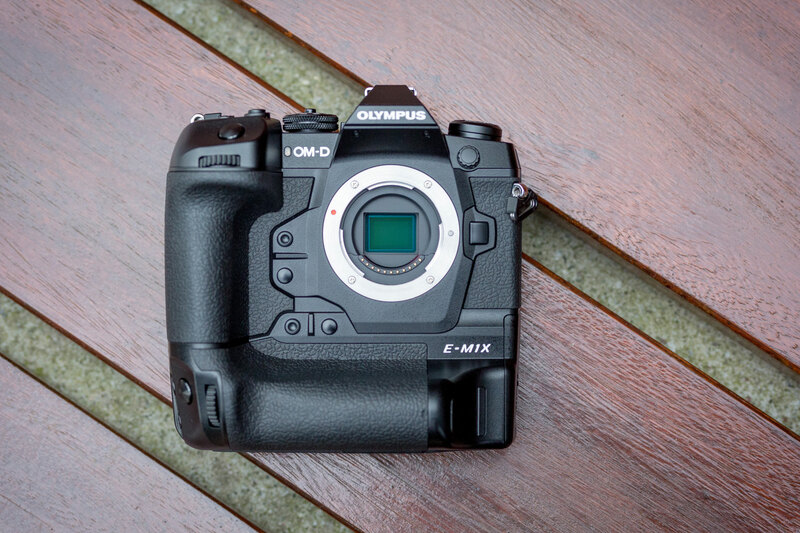 With its rugged weather-sealed magnesium alloy body and integrated vertical grip, Olympus is placing the E-M1X squarely in the same bracket as Canon and Nikon’s pro sports cameras. Its build quality really is excellent, with the big chunky handgrips making the camera extremely comfortable to hold for extended shooting. The controls are large and well spaced, making the camera easy to operate even when you’re wearing gloves, and I certainly appreciated this when shooting a total lunar eclipse at 5am on a freezing January morning. Both the SD card door and battery-tray release use twist-latch doors to prevent accidental opening, and Olympus says sealing isn’t compromised when using a microphone, headphones or a wired remote release. 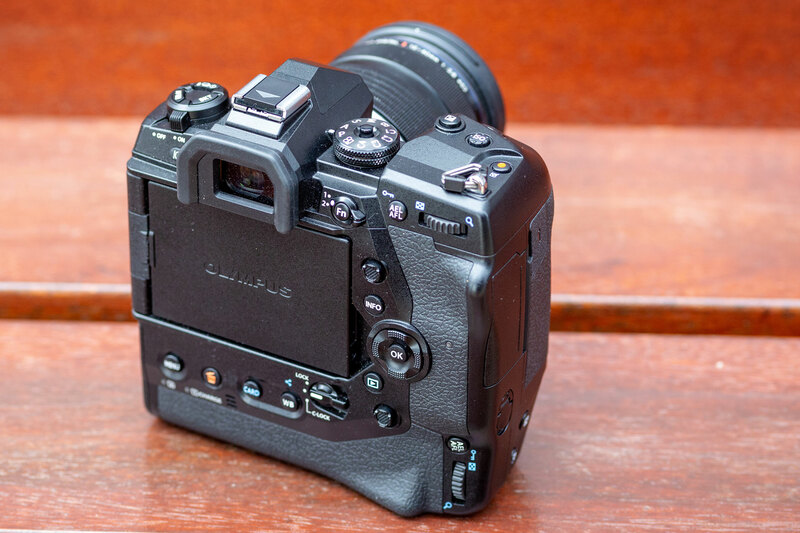 The control layout is broadly based on the E-M1 Mark II, but the larger body means that there’s space for even more controls. 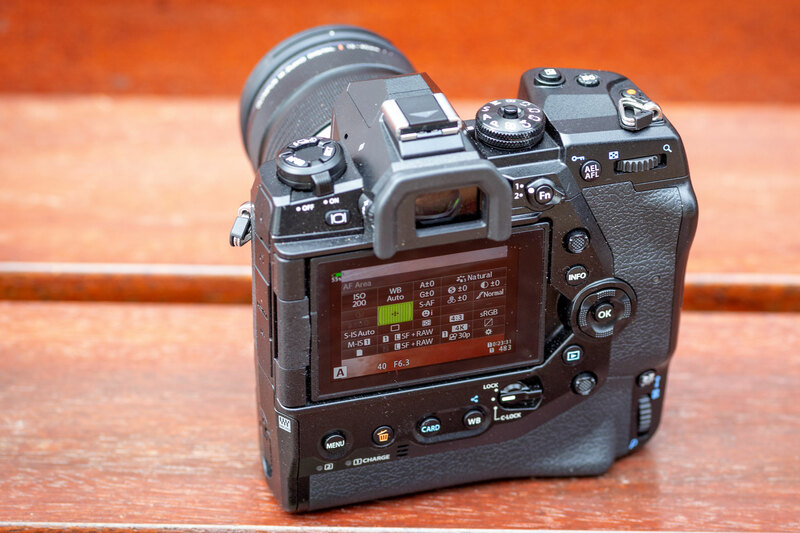 Most notably, there are new ISO and exposure compensation buttons adjacent to both shutter releases, and a white-balance button on the back. A large lever on the back allows you to disable the vertical grip, or alternatively lock-off a user-specified combination of buttons and dials. Almost all the main controls fall perfectly to hand, aside from the portrait format ISO button which requires an uncomfortable stretch of your forefinger. 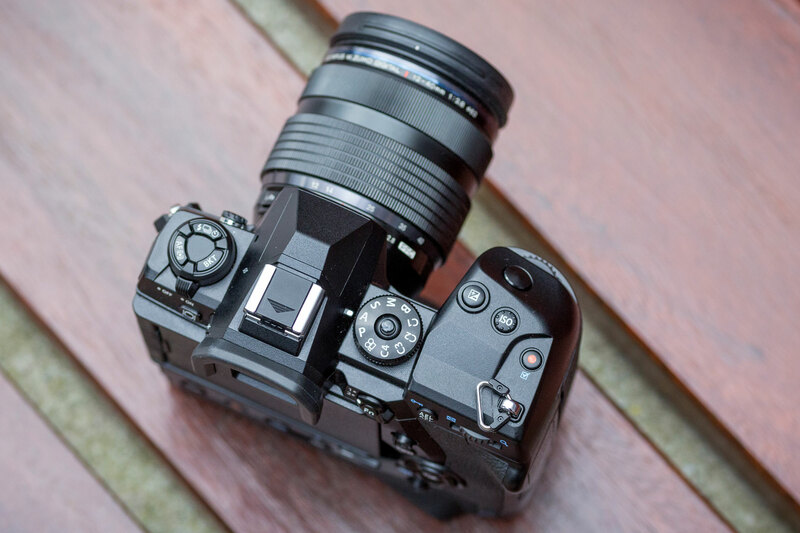 Where the E-M1 Mark II had a pair of buttons above the power switch on its left shoulder, the E-M1X now has three. These give quick access to flash, drive, metering, focus and bracketing modes, which are changed by spinning the front and rear control dials. Function buttons placed beneath the tips of your second and third fingers operate depth-of-field preview and one-touch white balance by default, but can be reconfigured to almost any other setting you prefer. In a long-overdue move, Olympus has also included a pair of joystick controllers for repositioning the focus point. Both fall naturally beneath your thumb, and are a huge improvement on using the d-pad on the E-M1 II. The AF area is highlighted in an easily visible green when you move it around the frame: this shouldn’t be remarkable, but it’s a welcome contrast to Sony’s insistence on ‘highlighting’ the focus point in invisible grey. 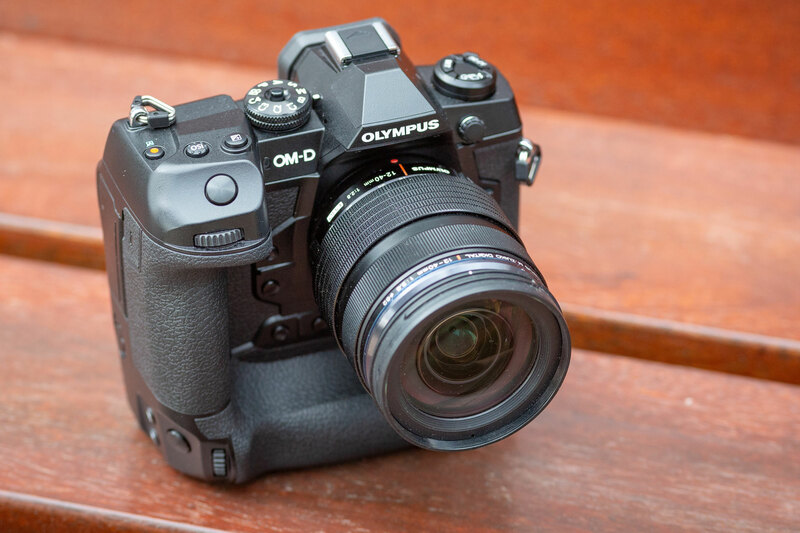 Some photographers will be surprised by the fact that Olympus hasn’t provided a separate AF-ON button for activating the autofocus independently of the shutter. But the idea is that you use the AEL/AFL button instead, which essentially changes function to AF-On when you switch to C-AF. Like almost any control on the E-M1X, you can configure exactly how you’d like it to behave, and even set it up differently for S-AF, C-AF and MF modes. With all these buttons, dials and switches, the E-M1X has all the external controls you could possibly ask for, and arguably more. Not only do you barely have to enter the menus, you rarely have to bother with the onscreen super control panel, which is crucial to operating lower-end Olympus models. And while the controls are almost infinitely customisable, the camera is so well set up out-of-the-box that I found little need to change anything. I re-set the main dials to my preferred layout, but that’s all. Olympus’s huge and convoluted menus haven’t changed, though; indeed the custom menu now stretches to 23 pages. Thankfully, Olympus has finally added a My Menu where you can compile up to 35 of your most-used settings, which makes things much more manageable. It’s also come up with an uncharacteristically elegant method for adding items, by pressing the video button when they’re selected. This works really well, and leaves the other manufacturers’ far more complicated approaches looking pretty silly.